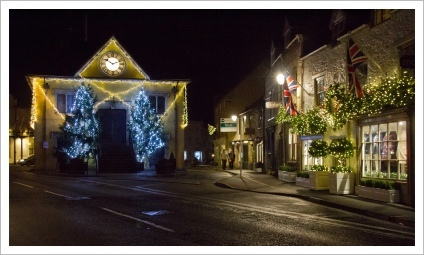 Although the Christmas lights in Tetbury were first improved by the ‘Christmas in Tetbury’ organisation in 2010, six of its members were also members of ‘Tetbury in Bloom’. 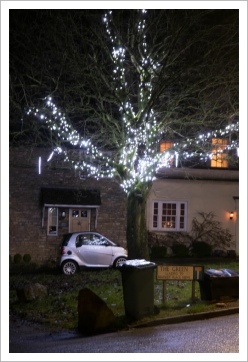 When ‘Christmas in Tetbury’ folded in January 2018, ‘Tetbury in Bloom’ took on the organisation of the Christmas lights under its own banner. 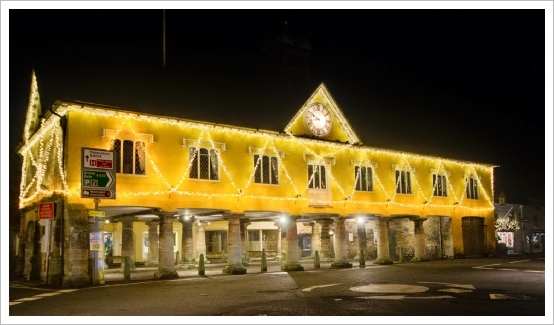 The Market House at the centre of town has always been the focal point of Tetbury’s decorations, and each year it’s been beautifully decorated with white lights supplied and erected by the Feoffees of Tetbury themselves. This includes the two Christmas trees either side of the front door which are, and have always been, kindly donated every year by Mr & Mrs Lowsley-Williams of Chavenage House. The only large permanent tree that was decorated with white lights was the one on The Chipping and the few Christmas trees that adorned the shop premises were decorated with a mismatch of different lights in a variety of colours, sizes and types. The festive motif lights on the lamp posts were few and far between and those that were erected were only partially working. 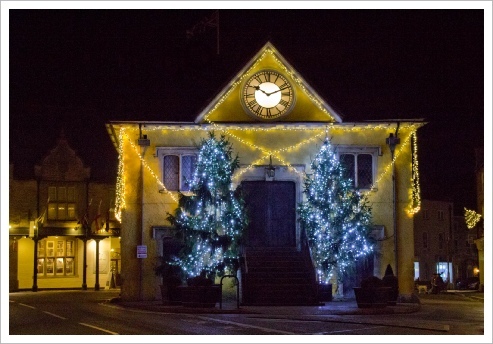 Overall, apart from the Market House, the town’s Christmas lights were in much need of total revamp!. To create a WOW factor within the town centre, it was decided that a uniform look should be adopted. 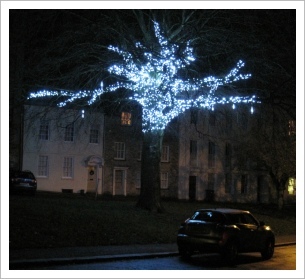 By by tying in with those already used on the Market House, white lights became the chosen colour theme. 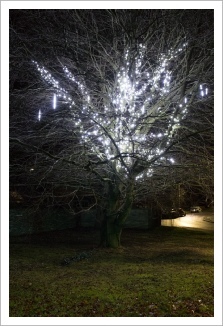 Funds were raised to initially purchase sufficient ‘warm white’ LED lights for all the shop trees. 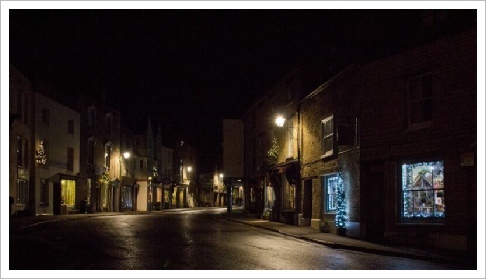 Organised originally by ‘Christmas in Tetbury’ but now continued by ‘Tetbury in Bloom’, each year a Christmas tree service is provided whereby shop owners can purchase a tree that is lit with 180 white LED lights. The trees are erected on the buildings and at the end of the festive season, they are taken down, the lights removed and the tree disposed of. The ‘Tetbury in Bloom’ volunteers have always dressed and undressed the trees and KP Gardens are employed to supply, erect, take down and dispose of them. The small profit that ‘Tetbury in Bloom’ now make from this fundraising initiative, goes directly towards making the town look and feel good throughout the entire year. 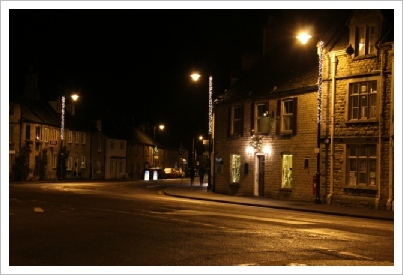 Following the town’s colour theme, most of the shop owners decorate their windows using white lights and also some provide their own trees outside. 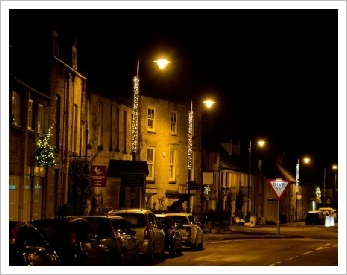 Sets of white lights can also be hired from us at a small charge which again goes directly towards the funds needed every year to keep the town looking its best. 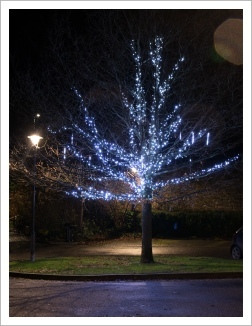 With very generous sponsorship over three years from Highgrove Enterprises, ‘cool white’ LED lights, to match those already in the Chipping tree, were chosen for four more large trees around the town centre. 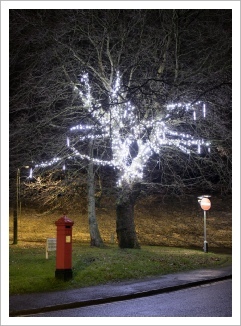 Most of the street lighting in the town centre is provided by wall lamps attached to buildings and this makes them unsuitable to have Christmas lights attached, however, fourteen lamp posts in the Hampton Street, London Road, New Church Street and Long Street junction plus two in Market Place, are now simply decorated with ‘warm white’ lights that spiral up and down the lamp columns. 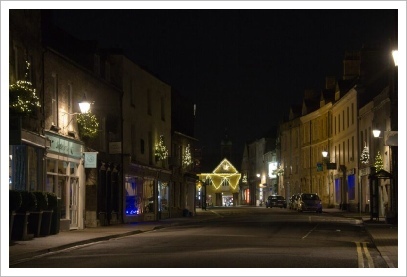 Shortly after ‘Christmas in Tetbury’ formed, the Feoffees decided to upgrade their tungsten lights to LEDs, using ‘warm white‘ for the building itself and later on, ‘cool white’ for the two large trees. Over the years the lighting displays have got better and better and we think the results now speak for themselves.